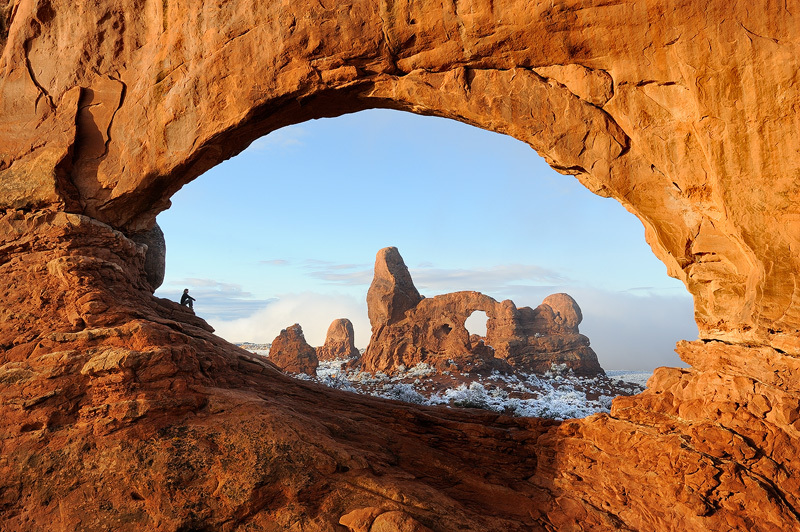 Before my first visit to Arches NP in Utah, I had seen many pictures of Turret Arch shot through North Window, and never had I noticed that North Window was actually this big. It wasn't until I walked towards this giant opening myself that I realized that I had been completely wrong. It's a way more impressive scene than the photographs I had seen ever suggested. The first thing I therefore did was to add a human element to the shot to give a sense of scale to the image. It's still the same icon that's been shot to death, but the combination of the human element and the snow in the background make it just a little more different from the rest, which was all I was after.